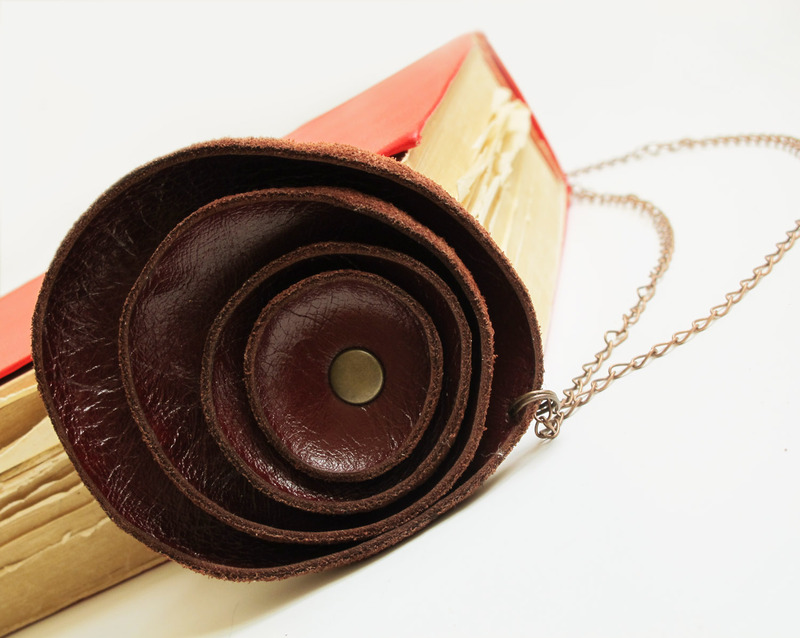 With this leather poppy pendant just listed in my Etsy shop I open FREE worldwide Shipping for all fabric and leather jewelry and accessories! That all sounds great? Offer valid till 1 December. I present you my latest creation - Short necklace MORNING DREAM. 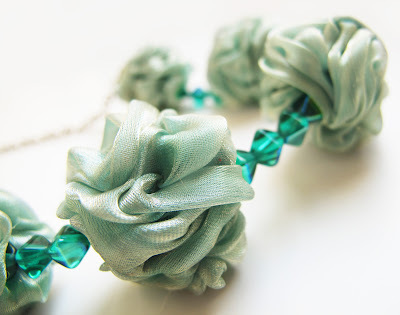 I made 5 beads in special technique from organza fabric. They are separated by green glass beads in this beautiful necklace in a shimmery shades of emerald, tea green, teal, white and more! 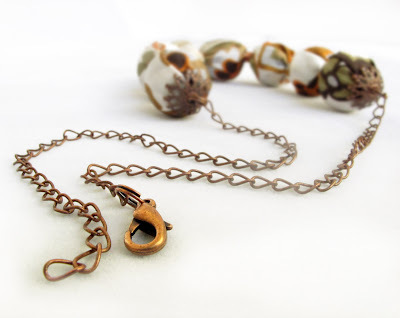 This gorgeous necklace you can combine with shades of brown and tan on the clothing. Teal and emerald green dresses with sophisticated prints at the height of fashion now. 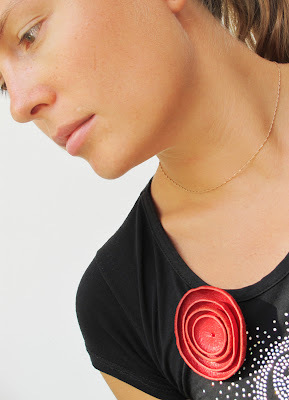 What can be better for this dress than beautiful necklace! 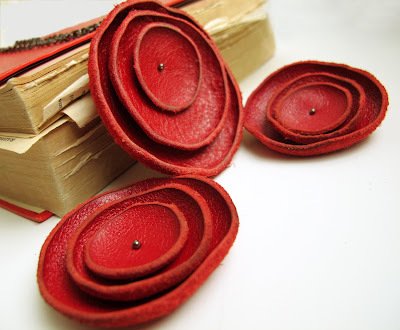 You can find it and many other fabric and leather jewelry in my Etsy shop. My name is Alla Sharkova. I was born in Baku, Azerbaijan and moved to the United States when I was 19 almost 20 years ago. Here I met my husband, who was also from Baku (talk about coincidences) and we have eventually married. Now we live in Bethesda, Maryland and have two wonderful kids. How long has the artist in you been 'unleashed' for? My life has been split between math (yes, math) and crafts for as long as I can remember. Math won out in my professional life, and I became a software engineer. 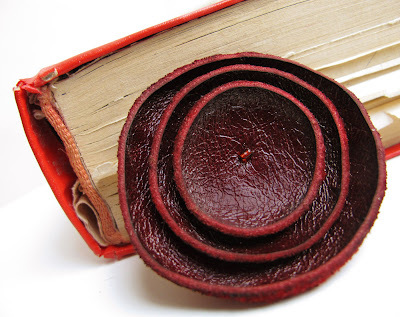 Reading and crafts have always occupied my free time - while I had free time, that is before the kids were born. I learned to sew at 6, to knit and crochet at 8, made my own clothes, worked with wood, drew with ink and ballpoint pens, had a photo lab in my bathroom… but nothing stuck for a long time. 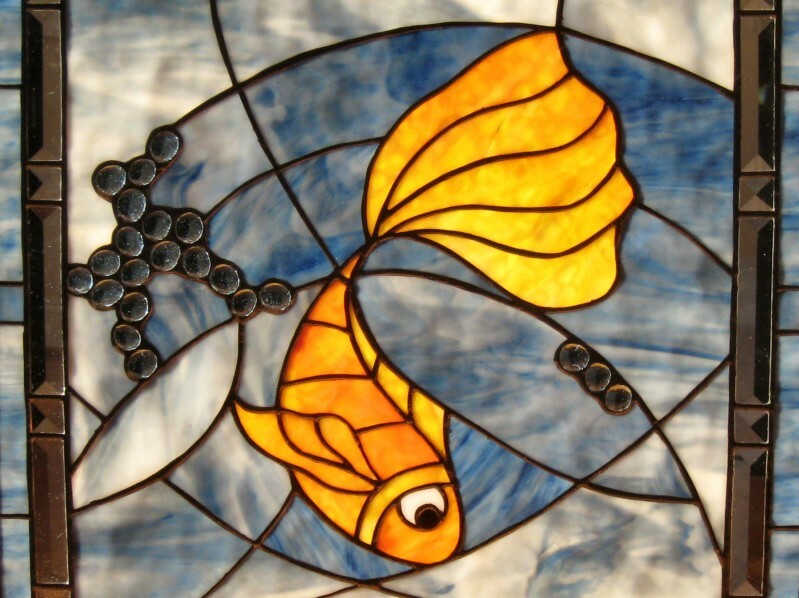 Working with glass always seemed magical to me, something out of this world, not to be tried by mere humans. So I've always wondered how it was done but never had an opportunity to find out. That is until the summer of 2002 when I saw some tools, a book and a box of glass being sold at a yard sale. I bought it all and that same evening I cut my first piece of glass, wrapped it in foil and soldered it back together. 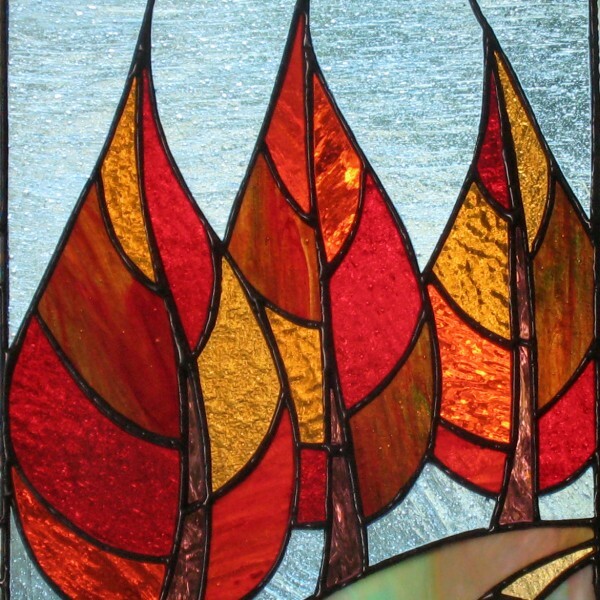 That evening I realized that I too could work with glass - and it was my dream come true. I sell anything I think would be fun to make out of stained glass and have around the house: window panels, sun catchers, lanterns and refrigerator magnets. Stained glass is an ancient medium that has been at a disadvantage lately. It is flat and rigid and needs to be lit in a certain way which makes it hard to compete especially with computer-based art. 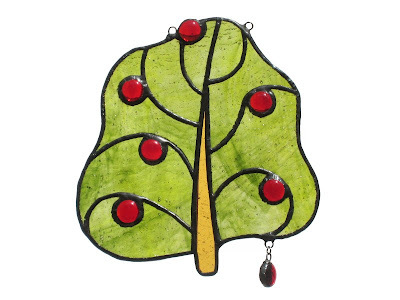 I would love to come up with the way for stained glass to fit into the modern lifestyle. 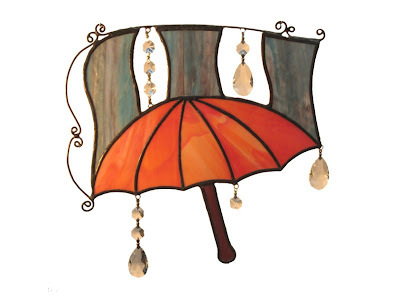 I make and sell items that I would (and do) place into my house to make it more beautiful and whimsical. I sketch whenever and wherever I get an idea. 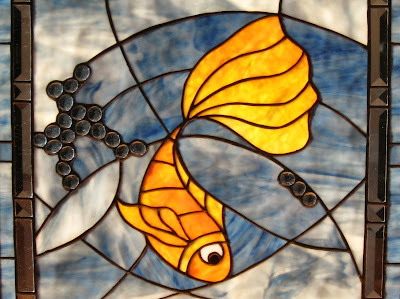 When I make time to work with glass, I pick out a sketch that matches my mood the most. My sketches are very basic and each has a little story associated with it. I let my sketches transform depending on the music I listen to as I work, the story I came up with, and the glass that lends itself to the piece. Often the panel evolves so much while I work on it that it is hard to trace it to the original sketch... For me this evolution is the greatest part of the process because the finished product then is not just a colorful pattern, it becomes an illustration, a postcard, a mood snapshot. 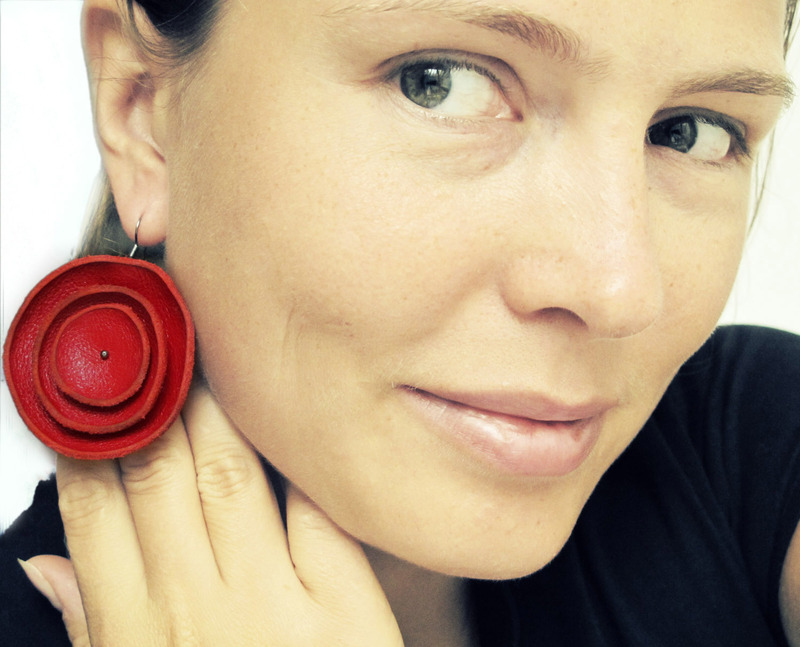 How did Etsy come into your life? For the longest time I have felt that I did not want to sell my works - I got too emotionally attached to them. I gave them as gifts to my friends and family, and donated a couple to charity auctions. I came to Etsy in December of 2009 mostly wishing to exhibit my works and still very reluctant to actually part with them. I am getting over that now :) I had some sales and the comments and feedback of my happy customers made it worthwhile. How did you come up with the name of your store? It was a very long process :) I was picking out the name even before I joined Etsy, when I was creating my website. All the names I liked were taken... One of the qualities I love in glass is that it drastically changes its appearance depending on lighting. I strive to build pieces that do not need a spotlight to look good. 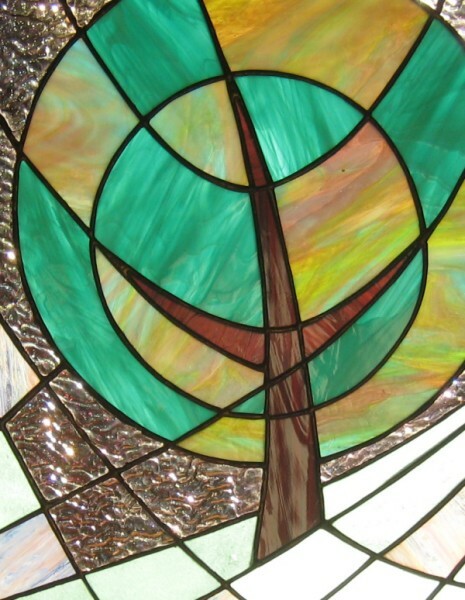 My stained glass panels are meant to be displayed in a window, with trees or buildings in the background, with shadows running through them. The surrounding rhythm of life is picked up by the glass and the panel is not still anymore, it is in fluid motion and that is what I hope will bring the feeling of fleeting stillness to them. And this is where the name Fleeting Stillness comes from. Yes, I do. I have made a number of pieces for specific settings in specific houses. What are your web site, blog, Twitter, Facebook page? Do not be afraid to take chances on art and to explore! We are happy to announce that the first EPL Magazine for The Autumn - Winter 2010/2011 is officially released! This is the first time an Etsy Street Team organizes such an event and we are really proud to see our groundbreaking idea be coming reality after hard work and dedication. 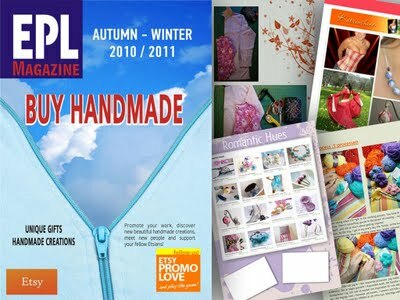 We would like to thank all of you for participating and embracing this great effort of the EPL Team to promote the Etsy community and the love for handmade in the best possible way. The Etsy Promo Love Team is proud to present the release of its very first official Magazine, that aims to the the promotion of Etsy as an online marketplace for unique handmade items. The issue is filled with beautiful creations from talented Etsy artists and enchanced with features such as interesting tips, “how to” techniques, useful links, interviews and much more! As the basic idea behind the formation of our group is mutual support, we would like to encourage our members to participate by promoting the Team. This can be achieved by being active on our Facebook page, but also through any kind of promotion that could help to spread the word. Therefore, the criteria according to which the second issue of the magazine will be created will be according to those factors. I'm happy to write that I'm featured in this magazine!! Two articles wrote by me was included too: first Tutorial: cutting and finishing spiral bones and second from Etsy Russian Team blog. The magazine will be published twice a year with different articles and themes each time! Today I present new addition to my leather jewelry and accessories collection. You can find it in special section in my shop. Crimson is a strong, bright, deep red color. It is endlessly multifaceted color. Perfectly go together with gray or light beige. Crimson was always the color of the Church. 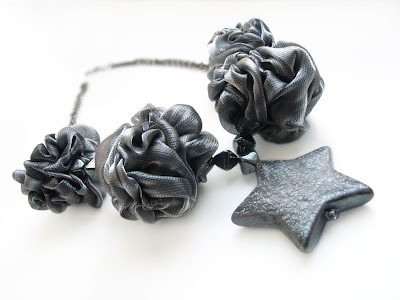 I present you my latest creation - Short necklace CINDER. 4 beads are made in special technique from organza fabric. They are separated by grey glass beads in this beautiful necklace in a shimmery shades of silver, grey, platinum, davy's grey and more! 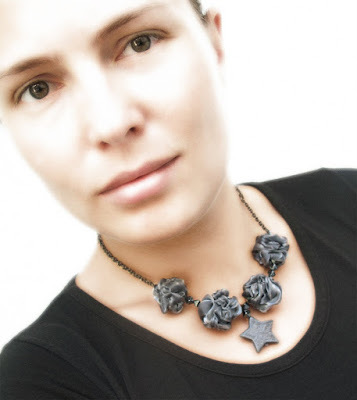 The necklace has the pendant in the center - grey star. You can matching it with bracelet. Gray - one of the most versatile colors in our days. It is absolutely befit to all men and women. Gray is practical. It is the color of elegance and neutrality. It can be combined with almost all colors and shades. Image of a girl in a gray today is at the top of the popularity in the world of fashion. A combination of black and gray looks very stylish. Gray goes well with pink, red and turquoise. 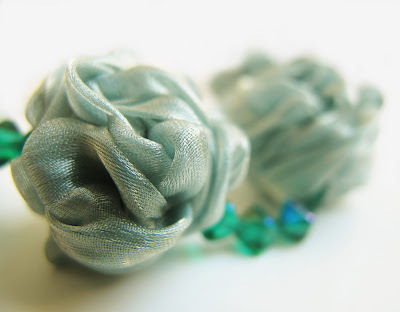 You can find it and many other fabric jewelry in my Etsy shop. 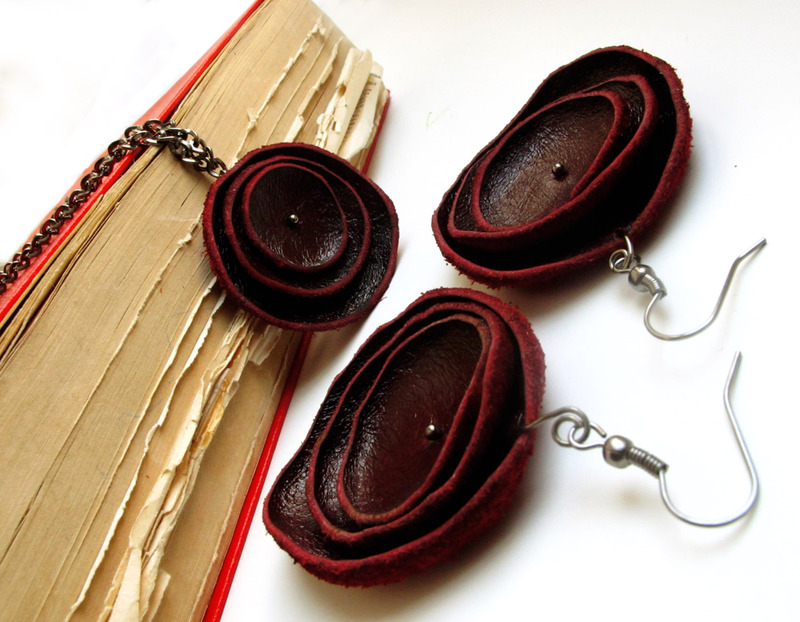 Today I present my new collection of leather jewelry and accessories. My first creation is Red poppy flower earrings, Red poppy flower necklace and Red poppy flower brooch. 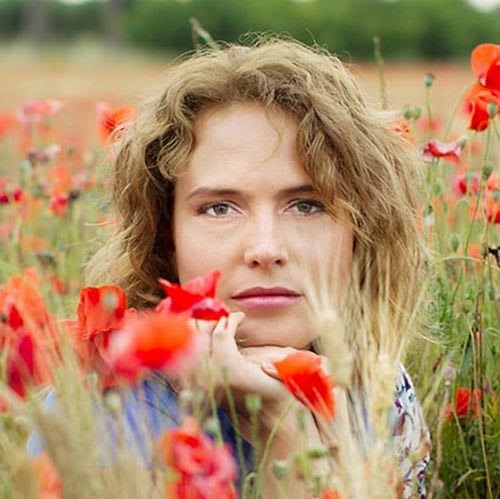 Red is a the color of passion, fire, life energy and absolute victory!! It's the color of courage and bravery. Red will not let anyone pass you, he immediately attracted attention. It's the color that does not leave indifferent anyone! 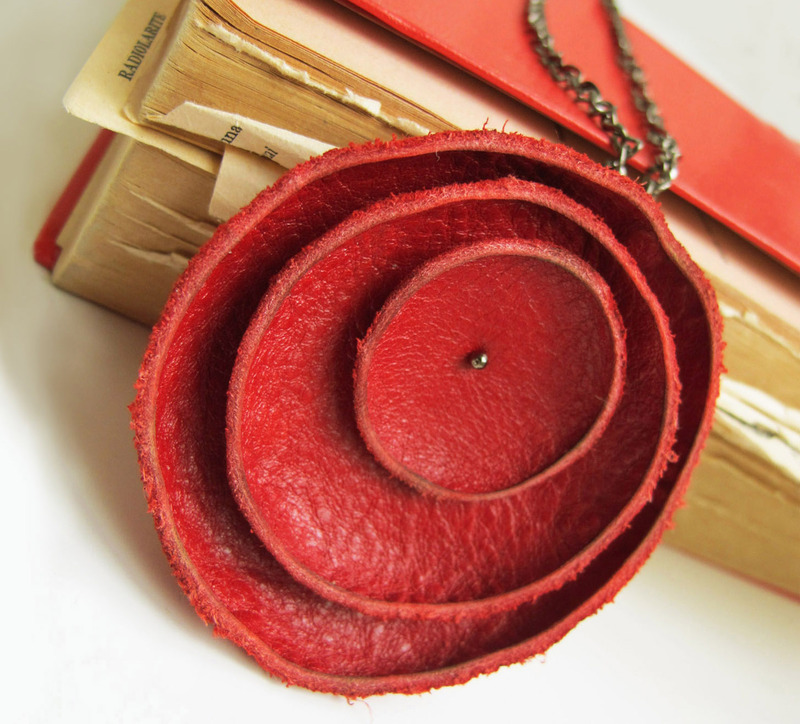 This necklace I named NUTMEG, because it has very warm color. It's the color of autumn, foliage and nuts. 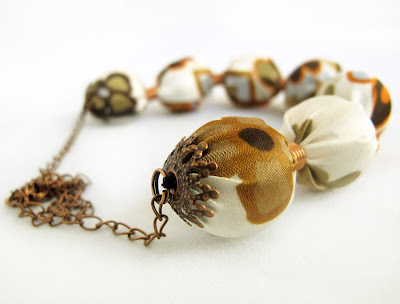 7 wooden beads are covered with silk stratch fabric and divided by copper spirals. The necklace is 51 cm/ 20” long and closes with lobster clasp. 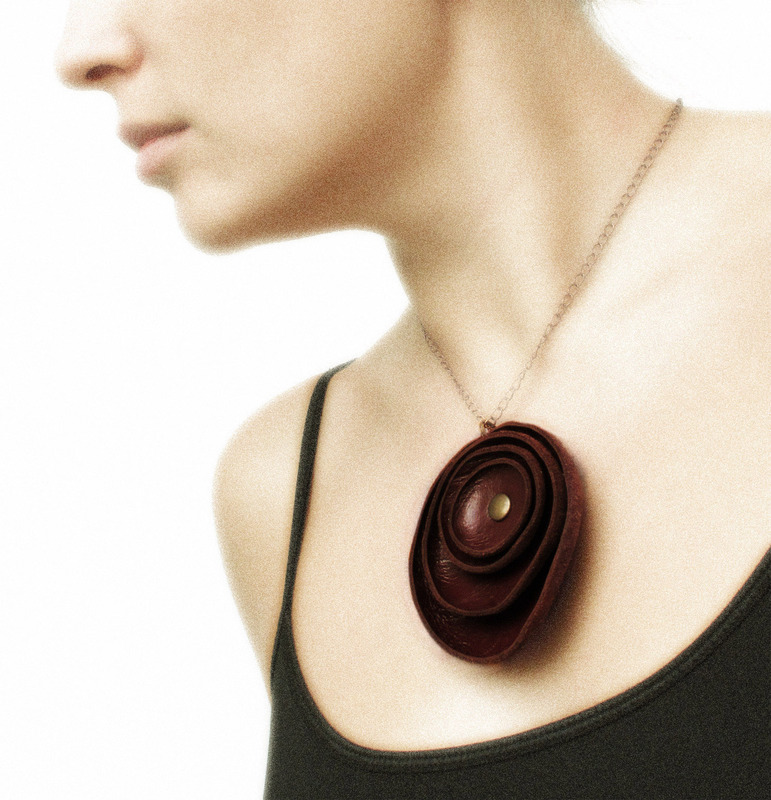 You can see it closer here: Necklace NUTMEG. 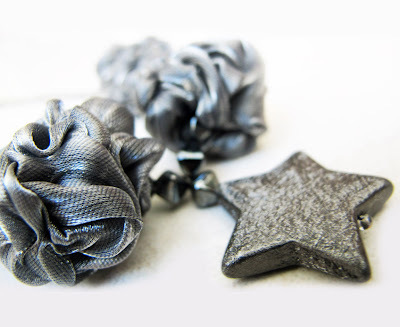 There is many other fabric jewelry in my Etsy shop. Today I'll write how to cook one of the best dish of Salento cuisine. Salento is a region in the south of Italy. It’s famous for his beaches and cuisine. The meal is named “Riso patate e cozze” – rice potatoes and mussels. 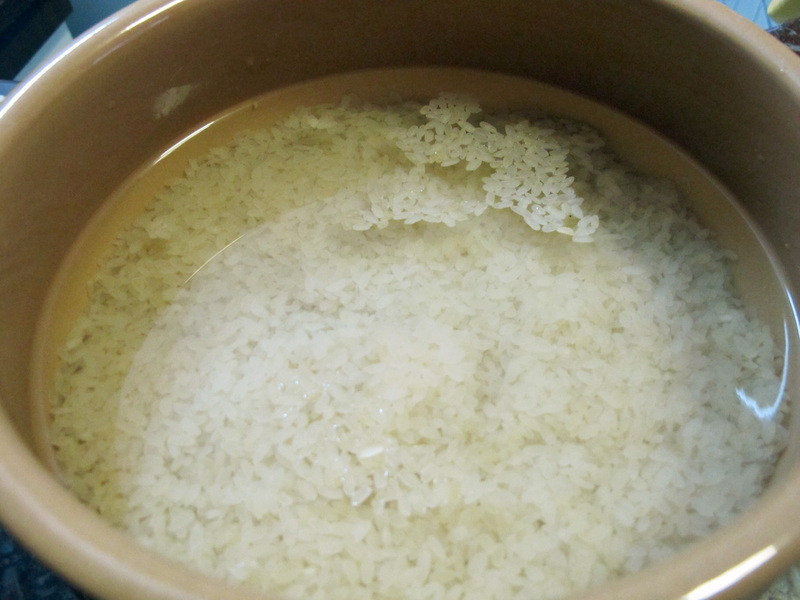 In a small container slosh the rice with the water and leave it. Peel potatoes. Cut potatoes into thin slices. Cut tomatoes to small pieces. Clean garlic cloves. Cut the onion vertically into thin slices. Put all ingredients in the big pot. Dredge grated Parmesan. Then pour the oil. Put salt and pepper. Top up little water and mix it well. Leave it for half an hour. Get a frying pan enough deep. We got the frying earthen pan, because we will cook in the stone oven. Remove the garlic from the pot. Pour a little oil in the pan. Put a layer of potatoes on the bottom of the pan. Then put the layer of mussels. Put a little of cutted parsley. Put remaining potatoes. Carefully pour in the pan all the liquid from the pot with potatoes. If the water does not reach the level of potatoes, add the water. If you don’t do this, the rice quickly absorbs all the water and the dish will be dry. If you pour too much water, the rice absorbs not all the water. Pepper it and dredge breadcrumbs. Pour some oil on the top. If you cook at home, heat the oven to 250 degrees. Put the pan in the bottom of the oven. When the potatoes seem cooked - the dish is ready. Put the pan in the top of the oven. Turn in the oven grill for some minutes for delicious golden crust. When you take out the pan from the oven, leave it for 10-15 minutes. It will be more flavourful. Enjoy the cuisine of Salento!